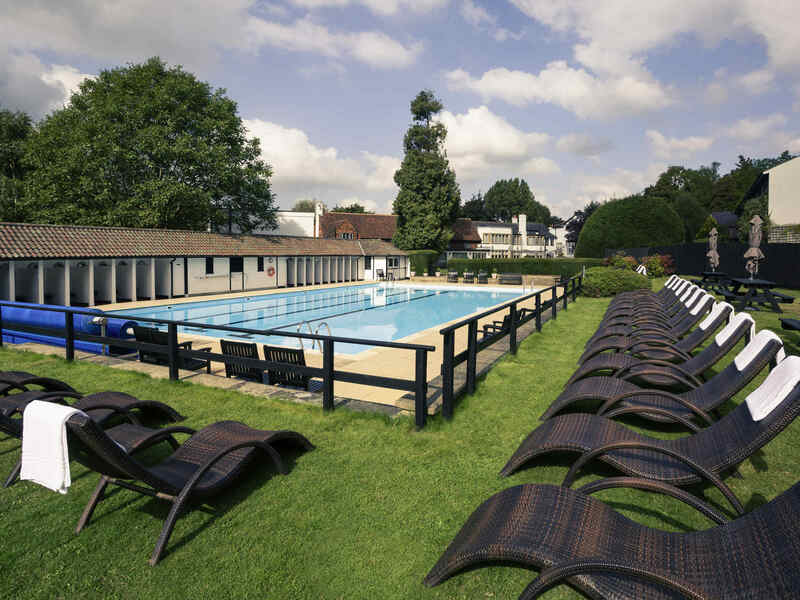 In an inspiring location close to London, 4 miles from the M25 and with local stations served by lines from Victoria, Waterloo and London Bridge, our 4 star hotel is well-placed for business travellers and the perfect venue for meetings.The hotel grounds are perfect for team building and other outdoor activities. WiFi access in all meeting rooms. Wedding and social event packages available to suit individual requirements. With their fresh new look, all of our 57 rooms are en-suite and offer modern convenience and comfort. You'll find air-conditioning, flat-screen TVs, free WIFI, tea & coffee making facilities, hairdryer, iron and ironing board and a trouser press.or 24-hour room service for something more. You'll find air-conditioning and all the usual things; toiletries, direct dial telephone with a direct line in, hairdryer, iron and ironing board and a trouser press. Rooms include a double bed, free WIFI, air-conditioning, telephone, TV, tea and coffee making facilities, iron and ironing board, trouser press, mini bar and en-suite bathroom with bath. Rooms include two single beds, broadband, air conditioning, telephone, TV, tea and coffee making facilities, iron and ironing board, trouser press, mini bar and ensuite bathroom with bath. Our Superior rooms offer extra living space and a balcony or patio with beautiful views of our gardens. The rooms include a sofa, complimentary mineral water and toiletries. I really enjoyed my two night stay. I had a garden room which was lovely, everything spotless. The Restaurant seems to have been ramped up, fantastic food and bigger portions than previously. Staff very friendly and go out of their way to ensure your stay is a pleasant more. Thank you! Generally good though the room bathroom smelled a little of drains and the new sofas are not very comfortable. We were staying as a wedding party guest. All aspects well covered with perhaps more thought to the lighting in the bedroom which was very dark. This made getting ready a challenge, especially the make up! The rooms were a little pricey and comfortable but nothing special. Service was OK but a little tense in places. As a group we spent over £2500 pound in one night. We had nothing to complain about but we experienced no special treatment . We enjoyed our short stay. The room was very comfortable. Lounge/bar areas were very pleasant and we enjoyed our Saturday dinner in Emlyn restaurant. Only downside - coffee and tea poor quality and taste. Excellent customer service, reception staff exceptionally helpful. Good breakfast. Beautiful hotel, friendly staff and tasty food. The only criticism would be the extortionate bar prices. Nearly £10 for a glass of wine, we got quite a shock when the bill came and went else where on the following night because of it. Found the same bottle in Tesco for £12. We enjoyed our I night stay here. We booked a superior room and the room was comfortable, although a little on the small side. We had a small balcony/winter garden and were over looking the lovely grounds and garden and it was very peaceful. The bathrooms in the room are small and looking a bit on the tired side but adequate. The bar and lounge area was lovely and we enjoyed sitting there for drinks. Breakfast was good too. The day went extremely well, your staff were very professional on the whole. The rooms were nice. Was disapponted that I had to go downstairs to order room service, as the phone was not answered when I called several times. Reception was unmanned quite alot during the stay. Having had an accident in my room I have to say how good all the staff were in seeing that I was ok and providing meals in our room. Excellent ambience. First class helpful staff. Great breakfast. Flying into UK after busy round of meetings, I just needed a quiet environment and a friendly face. That's exactly what I got. The hotel and staff provides a very satisfying experience. From check in, to the restaurant experience, to the comfort of the room, this hotel is a gem. The staff at every turn made us feel welcome. The grounds and lobby areas made for a pleasant experience for our entire team. We had a lovely evening and stay in one of the garden rooms. We were looked after very well by Mervyn, Gurbir and Brigitte. The food in the barn was very nice and the trip to Silent Pool on the Saturday morning was very well organised. We look forward to working with the hotel on events in the future. I stay frequently in this hotel. I know the people and 99% they know my credentials: membership, billing address, etc. The last stay in February was a real surprise, I received a nice room with bonbons. This time I had to type in my billing address, give my email address, membership number, remind the receptionist on the drink voucher at check in. Huge difference. My booking was made exactly the same was as during the past bookings, not sure what happened.